Lincoln Fox has been a busy man these last few months. Not only is Lincoln sculpting in his studio and gearing up to teach a workshop at Scottsdale Artists' School in March, but he is also in the process of launching a brand new website! Lincoln was kind enough to take some time out of his busy schedule to give us a sneak peak into what is sure to be an amazing website and valuable resource for all artists. For the first time, Lincoln confesses he is about to launch a 'real' website. Although he has had a site for years, this time he is pulling out all the stops and creating the real deal. My plan is to make this website a real educational experience. The website will feature hundreds of photographs, predominantly my work and will include multiple views as well as various stages of progress. Videos footage will eventually be added to the site as well and will display various monuments and other works. Ideally a student (and we are all students) could go into the studio of professional artists and benefit greatly from just…"seeing". I once had the opportunity to see multiple photographs of the inside of Henry Moore's studio…what an illumination! I benefited so much by just looking (with a magnifying glass) at the dozens of studies, unfinished maquettes, and objects he had lining the walls and floor. Every artist has "there way" of creating… mine is to work on several pieces at the same time. I may go weeks or months without touching a specific work, but the beauty of this approach is that I work on the piece that most excites me…that day. Because I no longer try to force the creative process, each piece gets only my very best energies and I enjoy sculpting even more.Some photos will show short cuts and cost saving techniques when creating large works. 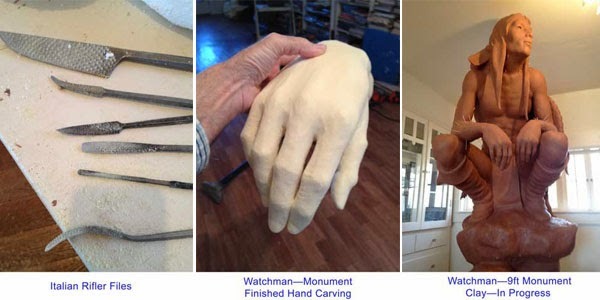 On one piece "The Watchman, " a nine foot bronze, I had the foam only rough cut… just enough detail to assure proportion and balance. 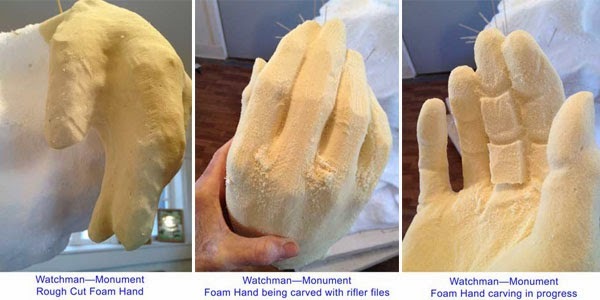 I carved the blocked out hands with Italian 'rifler files' (shaped marble files with a very rough tooth). I had never tried this…It was great! There was absolutely no effort or strain since the granular foam was so soft. On the down side, I had the opportunity to become even more familiar with my Shop Vac.